Oh golly, Pluto! I don’t often get the opportunity to draw non-Nintendo stuff, so I had some fun making today’s not-really-Mickey comic. And it also gave me an opportunity to throw a bone to Sonic Colors, apparently a decent adventure for the blue hedgehog. 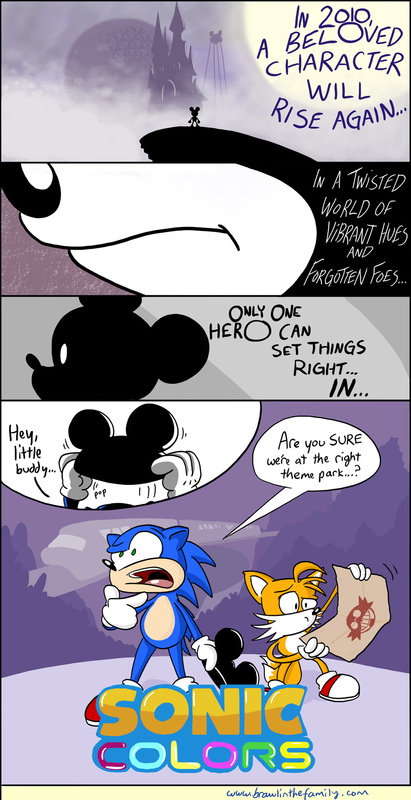 While I haven’t played it myself, I do know that ol’ Sonic is marching through a massive amusement park built by Eggman, so the idea of him getting mixed up along the way is funny to me. Plus the whole Epic Mickey thing going on right now helped make a less tenuous connection. I’m a big fan of EPCOT. Gotta love that Spaceship Earth! In other news, it’s now December, which means I should probably get started on whatever Christmas romp I’ve got planned for this year, right? Well, I’ve got some news regarding that; after much deliberation, I’ve come up with an idea for BitF’s Christmas 2010 comics, but I’ve decided not to do a story arc this time around (probably next year). I do have something fun planned, but it’ll have to wait until we’re a little closer to Christmas!